Cornas has a long history as a region cultivated with vines that dates back to 885. Most wine from Cornas were produced for the enjoyment of the local population. Although there are rumors that due to its robust character, during the early 1800’s, barrels of Cornas were shipped to Bordeaux and other regions to add strength and vigor to their wines. Cornas became an official appellation in 1938. Only red wine is produced in Cornas. The wines of Cornas were, until the 1950’s sold mostly to locals and in France. Few producers bottled and sold their wine. Most of the harvest, until the early 1980’s was sold to negociants. That is obviously not the case today. Perhaps the leading proponent of Cornas in those days was Jean Luc Colombo. A lot of credit certainly belongs to Jean Luc Colombo for pushing the awareness of Cornas wines outside of France. Cornas is small, with only 104 hectares under vine. Located just a bit south of St. Joseph, and north of St. Peray, the vineyards and terroir can be easily divided into three sections. In the north, you find granite and limestone soils. In the center, the terroir is mostly granite with clay soils. As you head south, you encounter granite and sand. The terroir is naturally warmer than all the other vineyards in the Northern Rhone, especially in the south, so Cornas is almost always one of the earlier appellations to harvest. You also find more hard granite in the steep hillside vineyards, which can run up to more than 380 meters, than you do in the flats, which has more clay in the soils. There are old vines in the region, some of which planted all the way back in 1914. Cornas is also shaped by its proximity to the Rhone river and the 11 streams that run through the appellation adding a lot of much needed moisture to the vines, especially in the hot, dry years. The Chaban is the most prominent of the 11 streams. Cornas remained a small, relatively unknown appellation until Robert Parker scored a wine 100 Pts, which made previously, uninterested collectors take notice of what was often considered to produce a rustic, tannic, masculine, character driven Northern Rhone wine. Today, that is no longer the case as Cornas wines are now growing in demand and price. To produce wine in Cornas, the majority of destem to some degree, depending on the vintage. Although the very traditional producers prefer whole bunch vinification and do not destem. The more modern wineries remove a greater part of their stems. Vinification takes place at many estates in open top, traditional cement vats. Other growers prefer stainless steel tanks. Very few domaines use a lot of new, French oak barrels to age their wine in. New oak is not as popular in the traditional appellation of Cornas, as you find in Cote Rotie or Hermitage. Although the more modern estates do use a large percentage of new oak. The wines of Cornas can show more of a stern, masculine, dark berry quality and gritty tannins than you find in the other Northern Rhone appellations. They can be quite backwards and require cellaring time before they are ready to drink. 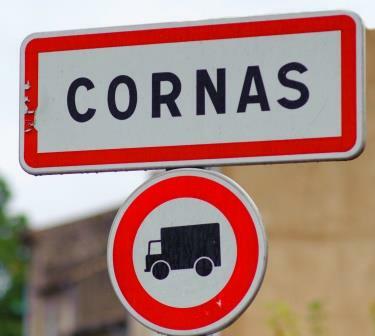 Like the other appellations in the north of the Rhone valley, more estates are now making vineyard designated wines and parcel selections in Cornas. The top producers of Cornas are: Alain Voge, Courbis, Auguste Clape, Thierry Allemand, Noel Verset, Jaboulet, Eric et Joel Durand, Johann Michel, du Tunnel, Michelas St Jemms, Maxime Graillot, Nicolas Perrin, Delas Freres, des Lises and Vincent Paris. The top vintages for Cornas are: 2015, 2010, 2009, 2007, 2005, 2003, 2001 and 1999.